Our range of products include CA glue half gram consumer pack and CA glue 2 gram consumer/ industrial pack. 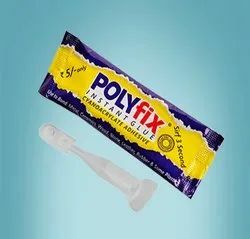 POLYFIX® Instant glue Cyanoacrylate Adhesive is easily available on hardware, stationery, general stores. It is easy to apply from plastic tube packing by twisting cap on DIY(Do it yourself) concept. Packing is ideally best suitable for single time usage or if properly capped it may also be used multiple times when stored at temperature below 20 degree of short time. Easy to use and Its rapid cure properties make ideally suitable for consumers at home to fix or repair things by themselves. POLYFIX® Instant glue Cyanoacrylate Adhesive is easily available on hardware, stationery, general stores. It is easy to apply from plastic tube packing by removing cap and getting puncture tube with Pin attached. on DIY(Do it yourself) concept. 2 gram may also be used by industries where the daily usage is very small. Packing is ideally best suitable for multiple times if properly capped and if stored at temperature below 20 degree. It is Easy to use and Its rapid cure properties make ideally suitable for consumers at home to fix or repair things by themselves. Usage- Footwear, handicraft, automobile, electronics, Utensils, Home repairs.